In a partnership the Chinese phone maker made with Microsoft, Xiaomi was sold about 1,500 patents from Microsoft and in return, Xiaomi pre-installed a bunch of Microsoft Apps on the Bezel-less Xiaomi Mi Mix. In fact, the phone comes with Microsoft Word, Excel, Power Point, Outlook Email, and Cortana, Microsoft’s personal assistant. 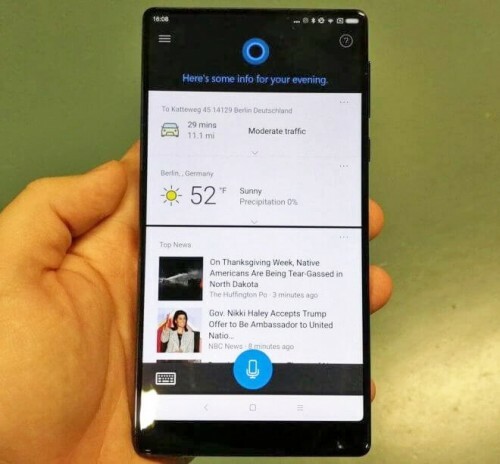 The agreement between Microsoft and Xiaomi happened back in June and Microsoft intends to “build sustainable, long-term partnerships with global technology leaders, with the ultimate goal of bringing the best user experience to our Mi fans.” You can also even wake Cortana by saying “Hey, Cortana” just like you can say “Okay Google” to wake some phones from standby.